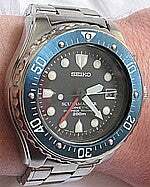 It may not be the most high-tech watch out there, but Seiko makes a good diver and this is no exception. This watch has a kinetic movement, which is a quartz movement powered by the motion of your wrist, and a 24-hour hand to show a second time zone. The case and band are made of titanium and it's actually quite a looker. Might be a bit hard to find in the wild, but there are others like it out there so keep your eyes open.